Leonardo da Vinci wasn't just one of the greatest painters of his time. He was also known for having some pretty out there design ideas, including an expansive stone bridge that stretched across the Bosphorus River. Da Vinci never saw his concept come to life, but now a group of students is building the bridge—with a few adjustments. 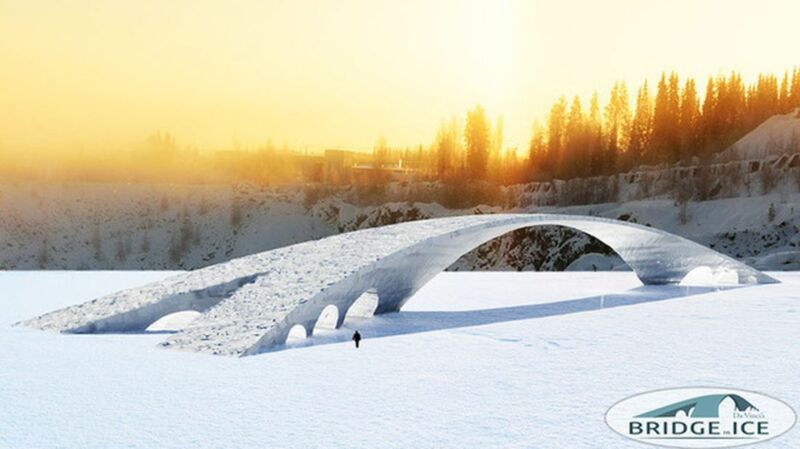 The final structure will be the world's longest ice bridge. The team of researchers and students from the Eindhoven University of Technology in the Netherlands began construction on the project titled “Bridge in Ice” on December 28 in Juuka, Finland. Still, the final structure won't exactly be an icier version of da Vinci’s design. His model, made of stone, would have spanned 790 feet across the strait of Bosphorus that connects Europe to Asia. When this latest project is completed in mid-Feburary, the ice bridge will stretch 115 feet. In order to ensure the material is sturdy enough, the engineers will combine paper fibers with water and spray that mixture onto massive inflated molds. Once frozen, the reinforced ice will be three times as strong as regular ice, strong enough to allow pedestrians to walk across. The team even plans to test the bridge's stability by driving a car over its surface. To complete the project, the student engineers will need use a whopping 900 tons of ice, according to Live Science. And with Juuka’s current temperatures plunging below 0, Finland is probably a much smarter location than where da Vinci originally had in mind.